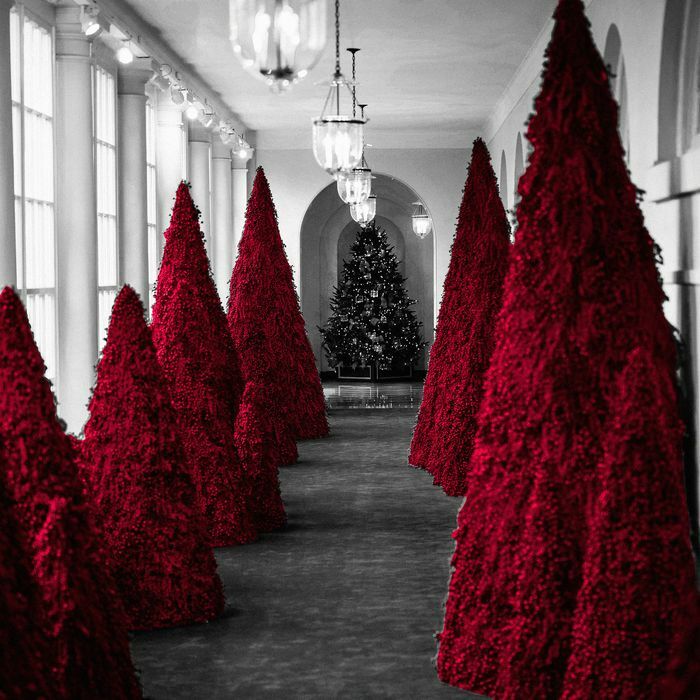 What should we make of Melania Trump’s festive gauntlet of all-red, elongated — nearly Giacometti-like — Christmas trees lining the East Colonnade of the White House? Why does this decorating choice feel so peculiar? Typically Melania has had little to say, insisting simply that the trees looked “fantastic” in person (of course how many of us will see them that way?). And her office claimed that the monochromatic trees were actually a nod to the red pales or stripes on the presidential seal, and that the color stood for “bravery” and “valor” — an answer meeting the usual White House quotient of truthiness. We get nowhere reading Melania’s trees for hidden imagery — cryptic, nuclear, faux-patriotic, or otherwise. Instead, let’s read the relationship we seem to have established with them — to understand why we feel so compelled to make sense of these damned trees, and why they generates so much un-ease. Whatever cloud-pictures you choose to see in Melania’s trees, something feels emotionally off about them. Despite their otherwise warm shade of Noel crimson, these trees evoke a discomfiting coldness and a feeling of refusal. Here’s why. Christmas trees, no matter how stylized, like all celebratory adornments (gift wrapping, party streamers), create a festive feel via visual intricacy, through contrast, pattern, light, movement, and variety. Silver tinsel glints against green branches; ornaments catch and reflect light; diverse shapes play off one another. Christmas trees invite the eye to move — to dance even — over their surface, taking in the different colors and textures. This visual movement over diverse components creates interest and delight. Melania’s trees do just the opposite. In their uniformity they refuse visual difference or movement. And although they are in fact made up of many discrete elements — each tree consists of thousands of tiny berries — these myriad elements have all been compressed and molded into sameness. One dense shape, one dense color. No surface variations. These trees refuse visual and textural diversity, giving the feeling of homogeneity forced upon a mass, the forcible unification of multitudes — ironic, given this administration’s apparent views on racial diversity. The trees, in other words, refuse to participate in the expectations we have of their genre. They will not sparkle amusingly for us. They will not divert the eye or suggest bounty or joy. These trees outright reject their traditional function, exactly as Melania does. And since one of the First Lady’s traditional functions is, precisely, White House Christmas decorating, the trees display a double-level resistance. It makes perfect sense that this FLOTUS decks her halls with impeccable topiary that just says NO to both wifely and Yuletide cheer. We are by now long familiar with Melania’s theater of resistance, her habitual turning of her back to us. These trees are like another fashion statement, the arborial equivalent of Melania’s incongruous stilettos in flood zones, aggressive jacket-messaging, tone-deaf pith helmets, and— especially — her mirrored shades and trademark middle-distance stare, which bespeak her refusal ever to return our gaze. That refusal is what we are trying to read, to get a purchase on. We correctly feel rebuffed by blankness, which goads us to keep trying to understand, to make sense. And so we have turned Melania into our Rorschach blot, a test of anything we fear from this administration: misogyny, angry monsters, nuclear war. In one way, we might applaud Melania Trump for her consistent rejection of the pre-feminist conventions of First Ladyhood. Why should she evince motherly warmth at the holidays? Why should she go all Christmas-cookies on us when that is clearly not her style? And yet, in sloughing off this retro image, Melania simply reinforces another one. Instead of the inviting hostess, she offers a different kind of parodic femininity, one that perpetuates the notion of woman as pure ornament, a commodity, as surface or shell — gift-wrap with no package underneath. That is where we find ourselves now, desperately seeking to discover the “package” of meaning beneath Melania’s resistant and glossy surface. Beneath her inscrutable persona and now, beneath her inscrutable trees. On a larger level, this is the situation in which the entire Trump administration places us. We gaze at it looking for meaning, for explanations, for logic, but find mere surface — the illogic of rebuffed questions. No, the president tells us, he simply does not “believe” the climate change report; MBS did or did not order the death of Jamal Khashoggi; he will or will not cancel his meeting with Putin. Over and over we feel the gap between surface and depth, answer and truth under this presidency. Melania is simply a condensed, decorative allegory for that. And so too are her silent red trees.